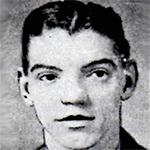 Tom was a very experienced goalkeeper who had been with Kilmarnock for eight seasons, winning the Scottish Cup in 1920, before joining Manchester City and then several clubs in Canada and the United States. He returned to Scotland with Ayr United in August 1931 and then Linfield the following year before he joined Dundee United as player/coach in May 1937. His playing career at United started and ended on his debut, conceding seven goals against St Bernards at the age of 45, after which Tom decided to hang up his boots. The following season he became manager of Albion Rovers.